Spicy Vegan Quinoa With Asparagus And Shiitake Mushrooms - Low In Calories And Perfect For Weight Loss! Spicy and delicious but only 250 calories a serving! For years I wasn't a big fan of quinoa. Whenever I tried to make it, it came out bitter and I disliked the consistency. I finally found out that to make good quinoa, it must first be soaked and then rinsed really, really well. Evidently there is an outer coating of saponin which gives it the bitter taste. Once I finally prepared it properly, I fell in love with this grain-like edible seed. This is truly a "Food For Long Life" as shiitake mushrooms were used medicinally by the Chinese for thousands of years and were a symbol of longevity! They are also a very good source of iron, an important nutrient for vegans. Fresh shiitakes are much easier to find these days and are so much better than the dried ones. Don't be put off by the price, they are pretty light. Also, don't throw away those stems you just paid lots of money for. They make an excellent mushroom or veggie stock. I pop them in a baggie and throw them in the freezer until I'm ready to make stock. This recipe calls for asparagus and red bell peppers but you can also add other veggies too. This weekend I made a double batch for a vegan potluck and besides the mushrooms, asparagus and bell peppers, I also added snow peas. They were a nice addition and gave it some extra crunch. Soak quinoa for 15 minutes. Drain and rinse in cold water for 3 to 4 minutes. Place quinoa in water in a 1½ quart saucepan and bring to a boil. Reduce to simmer, cover and cook for 10 to 15 minutes or until all the water is absorbed. Remove from heat and set aside. In a non-stick Dutch oven, heat oil on medium-low heat and sauté ginger, garlic and red pepper flakes for 1 minute. Add peppers and mushrooms and cook for another 5 minutes, stirring frequently, until the peppers and mushrooms begin to soften. Add asparagus and cook another 3 minutes until fork tender. Add soy sauce and lemon juice and mix together well. Mix in quinoa and serve immediately. Per serving: 252.9 calories, 6.0 g fat, 0.8 g saturated fat, 0 mg cholesterol, 13.3 g protein, 46.1 g carbohydrates and 8.7 g dietary fiber. You may have used the Raw Vegan Dessert Helper posted in May of 2009 as a fruit topping or a crust. 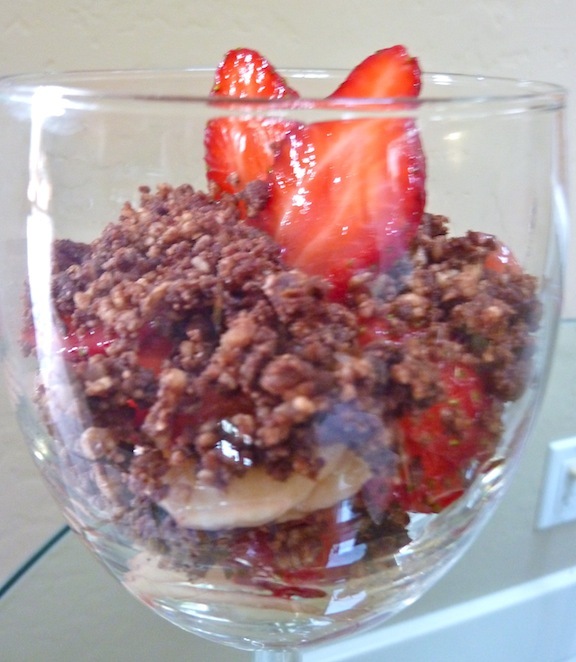 This fresh fruit combination of strawberries and bananas screamed for a bit of chocolate so I whipped up some English walnuts, dates and raw cacao and made a quick topping. The flavors meld perfectly and I think you'll really enjoy this simple, raw dessert. For this particular dessert, it's important to cut the strawberries and the bananas very thin. To make the strawberries less tart, I mix them with a single teaspoon of organic granulated sugar. This also makes the strawberries become juicy. Do this before mixing in the bananas. This healthful dessert has an added bonus. Each serving has nearly a gram and a half of ALA omega 3 with a 4:1 ratio of omega 6 to omega 3 fatty acids. It also provides 6 grams of fiber per serving. To make the crumble, add walnuts, dates, cacao and a pinch of salt to a food processor with an S blade and process until crumbly. Set aside. Cut strawberries very thin and place in a bowl. Sprinkle with sugar and mix well. Let them sit for a few minutes until they get juicy. Add bananas and mix well making sure all the slices are separated. Put 1/2 cup of fruit in each of four small glass serving bowls. Top each with a heaping tablespoon of chocolate crumble. Add another 1/2 cup of fruit to each bowl, topped with another heaping tablespoon of crumble. Per serving: 222.7 calories, 9.8 g fat, 0.9 g saturated fat, 1.4 g ALA omega 3 and 5.7 g omega 6 fatty acids, 0 mg cholesterol, 3.5 g protein, 34.8 g carbohydrates and 6 g dietary fiber. Follow Foods For Long Life on FACEBOOK! If you love Brussels sprouts, you'll love this hearty stew. Rich in cancer-fighting glucosinolates, this petite cabbages pair up well with new potatoes, pinto beans and carrots to provide a fiber rich stew for less than 300 calories per serving. Adding a few links of a spicy sausage like the Mexican Chipotle vegan sausage from Field Roast, gives it an amazing flavor. If you decide to leave out the sausage, the calorie count drops further to under 200 calories per bowl but you should add a chipotle pepper to the stew so you don't lose the spicy flavor. To trim the Brussels sprouts, cut about a quarter inch off the bottom of each Brussels sprout, remove the outer leaves and rinse well. Cut each one in half. Set aside. Heat olive oil in a large Dutch oven or soup pot and sauté onions and carrots until onions soften, about 8 minutes. Add garlic and cook another minute, until fragrant. Add Brussels sprouts, potatoes, bay leaves, broth, black pepper and salt and bring to a boil. Lower the heat, cover and simmer until potatoes and Brussels sprouts are tender. Do not overcook. Stir in the pinto beans and the sausage slices and heat thoroughly. Per serving (with sausage): 275.2 calories, 6.3 g fat, 0.7 g saturated fat, 0 mg cholesterol, 18.2 g protein, 43.7 g carbohydrates and 11.2 g dietary fiber. Per serving (without sausage): 196.8 calories, 2.3 g fat, 0.3 g saturated fat, 0 mg cholesterol, 9.5 g protein, 41.3 g carbohydrates and 10.8 g dietary fiber. Vegan Fettucini Alfredo Tricolore - Alfredo Without The Calories And Fat. Perfect Valentine's Dinner! I hate to keep picking on Olive Garden, but did you know that a dinner serving of Fettucini Alfredo has 1,220 calories and 75 grams of fat, 47 grams of which are saturated? Throw in 1,350 mg of sodium and you've got a pretty unhealthy meal. Since I love traditional pasta dishes, last night I made a "healthy vegan" version of this classic. Sneaking in the Extra Veggies! Back in November, I posted a Vegan Mac and Cheese where I used butternut squash as the base of the cheese sauce. It's a great way to get the family to eat more veggies! The Alfredo sauce recipe is similar except the secret veggie in this sauce is cauliflower! Even if you are still transitioning from a vegetarian to a vegan diet and are still using cheese in dishes like mac and cheese or Alfredo sauce, start blending in these vegetables and use less cheese. It's healthier for you and your family and you can start to wean your pallet from fat. Remember, fat, salt and sugar are addictive, (especially when combined) and companies like McDonalds spend millions determining just the right combination to get you hooked. They call it your "bliss point". 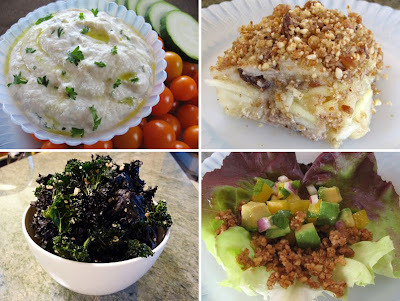 So weaning yourself from cheese can be tough, but simple and tasty vegan recipes like these can help you make the change to a healthier diet with less saturated fat and cholesterol! Whole Foods carries fresh, whole grain, vegan, tricolore pasta. I'm not sure if you'll be able to find it but if you can, I highly recommend it. But be careful, it cooks in just a few minutes. If you can't find fresh pasta, just make the recipe with a half pound of dry, whole grain fettucini pasta or spaghetti. Or, better yet, make your own fresh pasta! As soon as I learn how to do that, I'll blog it! I love my VitaMix blender. I can't imagine life without it (and I'm not getting paid to say this!). This Alfredo sauce whips up in minutes in a high speed blender and the best thing about it is that after a few minutes, it actually starts heating the sauce. But if you don't have one, you can use a regular blender or a food processor. You'll just have to heat the sauce a bit before putting it on the pasta. On medium low heat, in a small saucepan, sauté the onion in olive oil until soft, about 4 or 5 minutes. Add garlic and cook another 2 minutes. In a blender or food processor with an S blade, add cooked onion mixture, cooked cauliflower, silken tofu, buttery spread, nutritional yeast, salt and lemon juice. Process until smooth. Add a touch of soy milk if the sauce is too thick. Heat sauce in a sauce pan or by blending for several minutes if you have a VitaMix. Toss together with cooked pasta. Top with fresh parsley and serve immediately. My husband is the big dessert lover so when he says something is "the best ever", I take note. This isn't what he said with my first attempt at a vegan brownie recipe during the Christmas holidays. They came out hard and dry and ended up down the disposal. 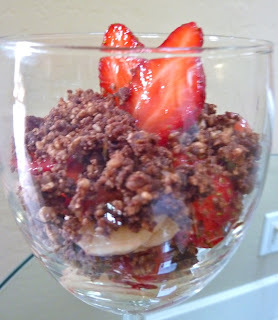 So I kept playing with ingredients hoping that I'd have something to blog for Valentine's Day dessert. The other night it happened - a great batch of moist, chocolate brownies with big chunks of heart healthy macadamia nuts. Raw macadamia nuts have a decent 6:1 omega 6 to omega 3 ratio so when you add a little flax seed to the recipe, you get a very good 2.6:1 ratio. To LIne or Not to Line? * No need to grease the bottom of the pan (although you still have to grease two sides). This saves the "hidden calories" no one ever counts. * After baking, you can actually lift the entire batch of brownies out of the pan, place them on the counter and easily cut them up. The only disadvantage is that it's a bit harder to spread the batter and keep the wax paper in place. If someone has a trick for that, please share it. Line the pan with wax paper extending up the sides. Grease the remaining two sides. Spread the batter evenly over the bottom of the lined pan. After baking and cooling for 15 minutes, carefully lift the entire batch out of the pan. In a large bowl, mix flour, stevia powder, baking powder, salt and cocoa powder. In a medium bowl, make a flax egg by mixing ground flaxseeds and water. Add sugar, olive oil, soy milk and apple sauce to the flax egg and beat well until it's well combined. Pour the wet ingredients into the flour mixture and blend thoroughly. Stir in the macadamia nuts and chocolate chips until evenly distributed. Pour batter into the pan and spread evenly. Bake for 20 to 25 minutes or until a toothpick comes out easily and mostly clean (it may have a bit of melted chocolate chip on it). Don't over bake. If you use a metal pan, it might cook faster. Remove from oven. Cool for 15 minutes and remove from pan (if lined) or just serve from the pan if not lined. Per serving (12): 175.5 calories, 8.1 g fat, 1.9 g saturated fat, 164 mg omega 3 and 426 mg omega 6 fatty acids, 0 mg cholesterol, 3.6 g protein, 25 g carbohydrates and 3.6 g dietary fiber. Per serving (16): 131.6 calories, 6.1 g fat, 1.4 g saturated fat, 123 mg omega 3 and 319 mg omega 6 fatty acids, 0 mg cholesterol, 2.7 g protein, 18.7 g carbohydrates and 2.7 g dietary fiber. For other Valentine's Day ideas, check out Vegan Mexican Chocolate Cake or Raw Vegan Tropical Chocolate Truffles. GuacaHummus - The Ultimate Party Dip! When avocados meet up with garbanzos, great things happen! When 2 Great Foods Meet! Doug brought home 5 avocados yesterday. But I already had 2 1/2 in the refrigerator! It must be time for his famous Guacamole. But wait, I had my heart set on hummus. I see a compromise coming - yes, it's time to make GuacaHummus! With some Hearty Vegan Bean Chili with Wheat Berries already on the stove, I'm thinking it's going to be a pretty good day! In a food processor with an S blade, blend garbanzo beans, tahini, garlic, lime (or lemon) juice, chili powder, cayenne pepper, and salt. Process until smooth adding several tablespoons of the reserved liquid if needed. Add one avocado and blend again. Pour mixture into a bowl. Stir in the finely diced 1/2 avocado, fresh parsley or cilantro and red onion. Adjust salt and cayenne pepper. Place in a small serving bowl and serve with healthy chips or cut up raw veggies like cucumbers, peppers or jicama. If you are not serving immediately, place the avocado pit in the dip, cover tightly with plastic wrap and refrigerate. Per serving: 109 calories, 6.4 g fat, 0.8 g saturated fat, 0 mg cholesterol, 4.0 g protein, 10.5 g carbohydrates and 3.9 g dietary fiber. OK Oprah, Here's A Vegan Superbowl Menu For You! As you may have heard by now, Oprah and 378 of her staffers went vegan for a week, It's nice to see a healthful diet that protects the planet and is kind to animals get some main stream attention. Although not all of her staffers warmed up to the diet, many of them were amazed that after just one week, they regained their energy, lost weight and felt better than they had felt in years. The biggest topic of conversation was their ability to finally poop! But we'll talk about that some other time. So here's a Superbowl menu for all current and future vegans out there to enjoy this Sunday! Let's Start with 2 Black Bean Salsa Recipes! My favorite is the one with the mango and jicama but I also love the cucumber, bell pepper and corn version too. I'll let you decide! Mix the lime juice with the garlic, jalapeno, salt and cayenne. Combine with the rest of the ingredients and mix gently. Add additional salt and cayenne if needed. Since most of you are covered in snow this weekend, I'm not suggesting you make these Vegan Rosemary Portobello Mushroom Burgers with Spicy Red Pepper Hummus and Watercress on an outdoor grill. No worries, you can either broil them or make them on a George Foreman indoor grill or I sometimes use my electric panini maker. Either way, these "meaty" burgers are a crowd pleaser. To make things easier, you can brush the marinade on before the game, pop them in a large zip lock bag and cook them when you're ready. Besides the hummus and watercress, you can also serve these with the more typical burger sides like thin slices of tomato and red onion. As a side dish, try serving Vegan Potato Salad. This healthy, mayo free version of this classic goes very well with the burgers. A baked crisp, like this Vegan Gravenstein Apple and Blackberry Crisp, is a great dessert choice for a day like this because you can prepare it earlier in the day and pop it in the oven during half time. The final moments of the game will be enhanced by the amazing smell of the baking crisp. But make sure you have a loud timer as the excitement might leave you with a burnt dessert! Although this recipe calls for Gravenstein Apples, you can use any baking apple and if you can't find blackberries, you can use any fresh or frozen berry of your choice. Serve with some store bought vegan ice cream or if you have an ice cream maker, make your own Vegan Mango Peach or Strawberry Ice Cream. Enjoy the game and don't forget to follow Foods For Long LIfe on FACEBOOK! Get Ready for a Raw Superbowl Weekend! 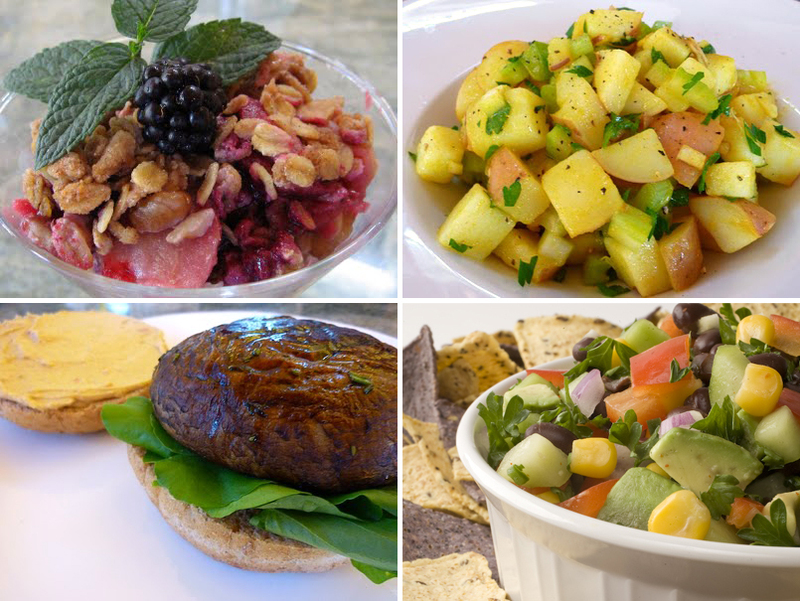 For those of you raw foodists out there who want more than just a few snacks to watch the game, here's an entire menu for you from some of our favorite past recipes. But you need to get started since the raw hummus needs some sprouting time! From kale chips, to a hearty pear and apple crisp, you and your guests will be satisfied but probably only if your team wins. No, not Doritos. Kale chips! I doubt you'll see any kale chip commercials on Sunday but these are really good. Check out Raw Kale Chips with Added Omega 3. Another very popular appetizer is Sprouted Garbanzo Bean Hummus but you'd better pull out your sprouting jars right away to get that one going. But don't fret, the Kale Chip post also links you to a number of other raw healthy Superbowl snacks. These Raw Vegan Tacos with a Simple Salsa have a delicious meaty filling made from heart healthy walnuts blended with your favorite chili powder a a bit of Nama Shoyu. Then you just need to make a quick little topping and you're done! There have been some beautiful apples and pears at the market lately so I thought it would be great to end the meal with a Raw Pear and Apple Crisp with Raisins. You can make it early in the day, cover it with some wrap and pop it into the refrigerator until you need it. I hope you enjoy the menu and may the best team win! I don't really care who wins this year but, as always, I look forward to the commercials! Cooking is the best thing you can do for your health! You will love these recipes! Detox, Lose Water Weight, And More! Make Thick, Creamy Vegan Yogurt With An Instant Pot Or Yogurt Maker - 5 Minutes Prep Time! Traditional And Alternative Methods Of Treating Morton's Neuroma - I've Tried Them All! Come See My Valentine's Day Tree! But How Do They Compare Nutritionally? Don't Throw Out Carrot Pulp - It Has Important Nutrients And Antioxidant Properties! Make Raw Vegan, Gluten Free, Carrot Pulp Crackers Instead! Copyright 2009 to 2013 Foods For Long Life. All rights reserved.